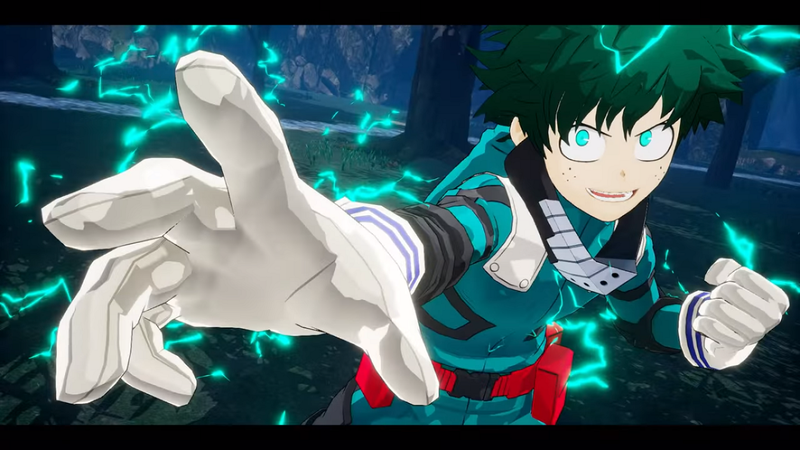 Jump Force was not the only Shonen Jump-affiliated fighting game shown off at this year’s E3. They also had one based around the ultra-popular (with me included as a fan) My Hero Academia, and honestly, I am more interested in that one between the two. It appears to have at least one intriguing idea going for it. When it comes to fighting games based on Shonen Jump manga, they seem to fall within two general classes. First, there are the more traditional fighting games. Those would include the likes of Dragon Ball Z: Budokai, the more recent Dragon Ball FighterZ, and JoJo’s Bizarre Adventure: All Star Battle. However, they have another set of games in their repertoire which aim to more closely and “realistically” replicate, so to speak, the idea of these combatants brawling in a more all-out three-dimensional environment. Chief among them are Dragon Ball Z: Budokai Tenkaichi, J-Stars Victory VS, and it looks like Jump Force will similarly follow suit. The key to how those three make it happen is through an over-the-shoulder third-person camera, which makes perfect sense for this kind of game. This would also happen to translate well in an online multiplayer context; each player will have their own TV screen or monitor to use. However, when it comes to the prospects of local multiplayer—and these are still fighting games; that ought to be a given—some logistical issues come up. Namely, the requirement of having one third-person camera per player, on the same system, playing on the same screen or monitor. On a single display, that means only one thing: Bringing out the split-screen. It’s an understandable solution—FPS games and racing games have used it for decades—but never the most ideal, and I’d imagine it to be exceptionally detrimental to a fighting game. Just look at the J-Stars shot above, and what they had to do for the sake of getting 16:9 widescreen ratio views for each player! That is a bitter compromise if I’ve ever seen one. Maybe we’d want to change this state of affairs by somehow placing the fully-3D action within a single camera? Take one look the most obvious examples of how this would manifest, however—3D arena fighting games like Power Stone or arguably even Gang Beasts—and it’s understandable why they’d probably have preferred the split-screen compromise instead. Those arena games use a single camera fixed at an overhead angle above the action, and selling the scope and momentum of the action as epic from that vantage point might be harder than a view positioned closer to the ground and (one of) the combatants. That is where My Hero: One’s Justice comes in. Seemingly stealing from an idea that’s previously shown up in the Naruto: Ultimate Ninja Storm series, indications are that they’re going with a solution that splits the difference between the third-person-view and 3D arena fighting game ways of doing things. It will be hard to know how well it works without actually playing it for myself, but from the looks of gameplay footage put out so far, it could very well fit the bill effectively. The camera, from what I can tell, appears to have this thought process: Start the match from a third-person view behind Player 1 that also keeps Player 2 in frame. Then, keep maintaining the third-person view from the player that is closest to the camera, while still keeping the other player in frame. If the other player ends up closer to the camera, start following them instead. Continue alternating as needed depending on who’s closest. That seems pretty solid! It keeps all of the action on a single camera, thereby foregoing split-screen, while also keeping the cool views reminiscent of the behind-the-shoulder vantage point; whose shoulder is being followed would just change throughout a match depending on how the fighting goes. It might potentially look even cooler than the pure third-person-view camera, actually, because switching views between the fighters could give a dynamic single-shot action take vibe to the whole affair. It may even look better than how Ultimate Ninja Storm executes things, but that’s wholly up for debate. All of this, of course, comes with the same big caveat that must be recognized for unreleased games that have not been played yet: Only time will tell as to whether the camera is actually fun where pure gameplay is concerned. Based on what is currently available, though, it is a design idea that’s promising at the very least. Finally, on an only slightly related note, despite all of that being said, my even bigger HeroAca fan girlfriend and I both agree that taken in its entirety, My Hero: One’s Justice seems like it could be some fun, but also hampered by clunkiness. What we really want is the FighterZ-style fighting game, damnit!! In a world with both Marvel vs. Capcom and Injustice, surely that is a most reasonable request?